Alpes Hostel was better than I could ever have expected! The bedrooms were clean and the beds, comfortable. I also loved the rooftop for soaking in the sun and having amazing drinks, thanks to the lovely Harianny! The staff was more than incredible, all of them just as welcoming as the last. Even though I've been away for only a few days, I keep thinking about when I'll come back to this hostel. Best hostel I stayed at in South America!!! The atmosphere is amazing, I met so many great people here! During my time here they organised barbecues and the bar is open every night, with great pisco sour. Thanks to Gustavo who was always making sure everyone was having a good time! The breakfast is the best one I’ve ever had, with pancakes, fruit, bread, juice and tea/coffee. The beds are comfortable and there’s air conditioning at night. I hope I’ll be able to come back here!! 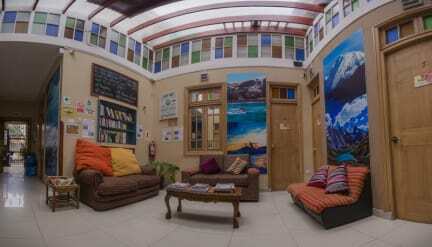 It was a truly incredible experience to stay at Alpes hostel, in the middle of Lima, where the people are social, the beds are comfortable, the bar is full of drinks, the music goes on all day and Jhemm will help you with anything. Awesome hostel with a super chill terrace. The beds are dangerously comfortable, don’t get sucked into the full-day nap trap. It’s a quiet area but close to the cool attractions. The staff are AWESOME, would stay again just to chill with them. Jhemm is a gem. I planned on staying 2 days but actually stayed a whole week because i really enjoyed it a lot! Really clean, good ubication and the staff was really great (much love to dorada and ricardo and i don’t know the other names but you were amazing guys, thank you so much for helping out with every little problem!) Also Gustavo mixes the best Drinks and his pisco maracuya is the besttttt! Only bad point: the breakfast was reeeally casual. Just sweet stuff! Thank you so much for the nice time! I was greeted with a free pisco sour. Very very friendly snd helpful staff, awesome terrace and common areas. I felt very comfortable and welcome. I am big on breakfast so their offering left something to be desired. All in all, highly recommended. Lindo hostel, tiene una terraza preciosa. Lo peor es la cinta que te ponen en la muñeca al entrar. No es necesario y es molesto. Reservamos una habitación privada, las cuales están en un hostel distinto a un par de cuadras del original. Este nuevo hostel es espectacular, cómodo, moderno y privado.